The Tiro 15 is available in eight different colors. The pants are constructed from 100 percent polyester fabric. An elastic waistband has an adjustable drawstring, so you can cinch the pants to suit your waist’s particular shape. The classic Adidas stripes run down the entire pant leg. There are zippers at the ankle for convenience. Close them when you need more streamlined pants, and open them if your legs need more breathing room. Zippered pockets allow you to store your varying valuables. The tapered leg fit streamlines your silhouette, allowing you to run and perform with less wind resistance. The biggest advantage of the Tiro 15 is the Climacool technology. This technology helps ensure that your legs stay dry and cool in warm weather, similar to breathable fabric in sneakers. The breathable fabric of the pants dries quickly to ensure you stay comfortable even during heavy activity. There are even strategically placed areas for ventilation. The breathable fabric channels fresh air through the pants with each step, cooling your skin and reducing the buildup of sweat. The Tiro 17 is available in significantly more styles, with 28 total colors and options to choose from. The stripes run down half the length of the pants. The construction is 100 percent polyester doubleknit fabric. As with the previous iterations, the Tiro 17 uses Climacool technology to keep you cool during physical activity. There’s a drawstring around the elastic waistband. In addition, there’s a mesh insert below the back of the waist. The lower legs have ribbing to allow a snug, slim fit. There are multiple sizes available to suit a variety of body types. The Tiro 15 is available in eight colors and styles, while the Tiro 17 is available in a whopping 28. This means that the Tiro 17 has more than three times the design variety of the Tiro 15. If you want to find the perfect pair of pants to suit your personal aesthetic, you’re more likely to find it in the Tiro 17 than the Tiro 15. The Tiro 17 makes use of the same breathable technology as the Tiro 15, but it also adds another level of breathability. There’s a mesh insert below the waist that isn’t found on the Tiro 15. Other than that, the biggest differences are minor tweaks in design. With the Tiro 15, the three Adidas stripes run down the entire length of the pants. But with the Tiro 17, the stripes only come to the knee. The Tiro 15 has ankle zippers, which makes the pants easier to put on. You can pull them on and then zip up the ankles afterward, rather than trying to squeeze your feet into a very narrow fit. In addition, the zippers make the pants versatile. They can be worn zipped for a tight fit, or unzipped for extra breathability. The Tiro 17 has ribbing instead of zippers. It’s still a good option for athletic wear, but it’s not quite as easy to pull on. Both trainers are made for athletes who participate in sports with a lot of running and jumping. The snug fit helps ensure you won’t trip over your feet if you’re playing soccer or other team sports. The construction of both pairs of pants is also very similar. 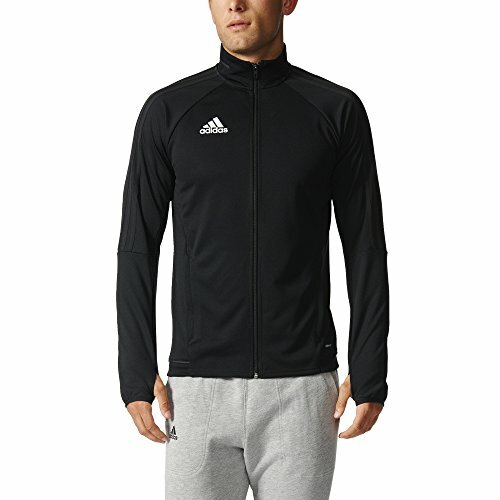 Both are made from polyester fabric, with the Adidas Tiro 17 being made of polyester doubleknit. Both sport the three classic Adidas stripes and close with an elastic waistband drawstring. Both pairs of pants are designed with breathability in mind. They both utilize Climacool technology. Adidas put a lot of time and effort into creating the breathable Climacool fabric. The company started their research by using thermal imaging and infrared cameras to make a three-dimensional body map. This map indicated the biggest areas in which sweat and heat are generated by athletes. Once these points were identified, the company began developing technology to address them. Climacool fabric pulls the sweat away from your body, rather than letting it build up and trap heat underneath. There’s also mesh paneling at the areas most likely to overheat, allowing fresh air to keep your body cool. After the fabric pulls your sweat away, it dries more quickly than almost any other option on the market. Adidas has incorporated their Climacool technology through a number of different lines of sportswear. It’s featured in the Tiro series, but you’ll also find it in shorts, light jackets, shirts, and sometimes even shoes. The Tiro 15 and Tiro 17 are both excellent training pants from Adidas. Neither is significantly better than the other, so the one you’ll prefer just depends on your personal priorities. The Tiro 15 has the advantage of zippers on the bottom, which makes putting the pants on easier. However, the Tiro 17 has additional style options and a mesh panel for increased breathability.